It was not for me, for my family, or for many of my neighbors, either. It began with some real high points. I began the year by welcoming the Rev. Dr. Chris Davies, a long-time friend, to the pulpit of Church of the Holy Cross. Quite aside from relishing her words of wisdom, I got to act out her reading of a favorite children’s book, and we celebrated communion together. I was wrestling with my first struggle of the year, however. I’d developed a growth on my nose in December. It had been removed, tested, and found to be benign, but I still had to have a MOHS procedure to make sure it was all gone, lest it return. So I wore bandages on my nose for a few weeks, including during a visit east in January. Brendan had begun working for Starbucks by then in Boston, and Rebekah was serving as an intern at the First Church of Simsbury, Connecticut. 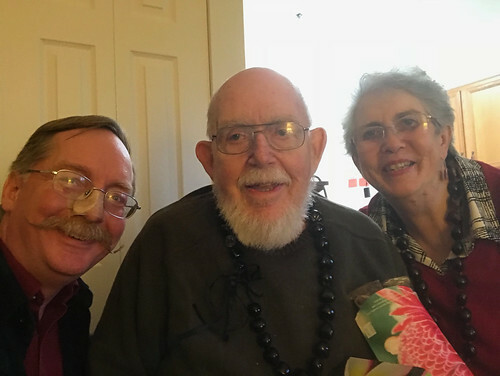 We got together with my father, recovering from his second broken leg in Massachusetts, and starting to get used to the new apartment he and Shirley had moved to. Paul Bryant-Smith and I enjoyed playing two Boys in Hats concerts in 2018 – pretty impressive considering the distances involved. In January we played at the Saugatuck Congregational Church in Westport, and in May we played at First Church in Simsbury. Rebekah and her co-interns sang one of my songs at the church in January with a proud poppa looking on. Lent came early, and we offered Ideas for Lenten Disciplines again. I maintained my personal discipline of #ThursdaysInBlack throughout the year. Also in March, I found myself seated at the same table with US Senator Mazie Hirono as the Zone Club of Hilo honored her and Irene Nagao with the Rose Award. I just tried to look like I belonged with the dignitaries. I finally got to see the Hokulea, the double-hulled canoe whose Malama Honua voyage circumnavigated the globe. She visited Connecticut’s shore not long after I moved to Hawai’i, and came to Hilo for the Merrie Monarch Festival. My father celebrated his 80th birthday in April. I was late to the party – actually, they delayed it so I could be there. I flew to Florida first, to take part in the UCC Pension Boards’ offering of CREDO, an education program for clergy. I was delighted to discover some good friends were among the group, and even better pleased to find how important the program was. I got a better sense of myself as a person and as a pastor, and made some decisions about steps to take in my life and work in the months ahead. But that would wait. 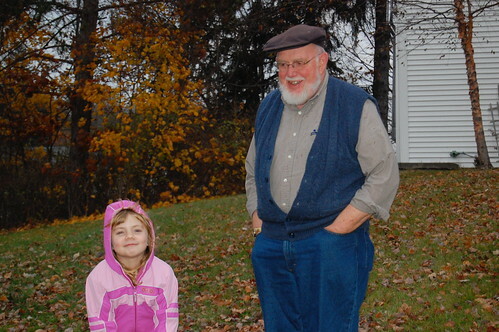 I spent the next week back in New England, where the family had gathered to celebrate Dad’s birthday. We enjoyed our lunch, helped him blow out the candles, and told enough stories about him that he felt like we could save some for next year. Even as we were doing this, lava had started flowing in Leilani Estates on Hawai’i Island. 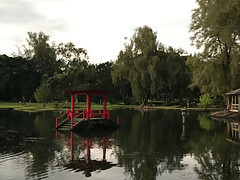 The Lower Puna Eruption of 2018 claimed 700 homes and displaced over 2,000 people. I returned home to join the faith community’s efforts to bring relief. We served meals, encouraged volunteering at the shelters, organized a laundry voucher program, and basically searched for the gaps in people’s lives. Our weekly meetings generated a lot of activity. I also returned home to face the loss of a dear church member. I’d had breakfast on Easter morning with Millie and her family – she proudly told me that though she couldn’t get them all to church on a Sunday morning, she could get everyone to Easter sunrise service. Hers was the first funeral of 2018, but not the last. Millie, Joe, and Margaret were all people I’ve come to know and treasure in these years. I gave their lives to God with an aching heart. My heart had more to ache about, because in June my father suffered an infection. We thought he’d overcome it, it turned out that his body had had enough. He died on July 1st as I spoke with him on the phone. Five days later, I was in New England with the family. Due to the kindness of the church leadership here, I was able to stay two weeks. Dad’s service was painful wonderful. Memorial words from Elva Merry Pawle, Chuck Ericson, and Paul Bryant-Smith brought tears and laughter. Paul and I played “Somewhere Over the Rainbow” (the Israel Kamakawiwaole version) and “The Great Storm is Over.” My brother and I looked over old photos, and then had to stop. Back in Hilo, the eruption continued. I kept up the work with the Faith Hui, worked with the Hawai’i Island Church and Ministry Committee, played every other Friday for our Community Sings, and planned a solo concert (my first in some years) for August. Our choir director Rachel Edwards and I discovered that we could do a pretty amazing duet of “Ain-a That Good News.” I wrote a sermon entitled, “This May Need a Song” – and so I also wrote a song. The week of the concert, disaster struck – again. The lava flow in Puna had subsided (though nobody was at all sure whether it might resume), and now we received a Pacific hurricane. Lane passed a hundred miles south of Hawai’i Island, turned north, and slowed. 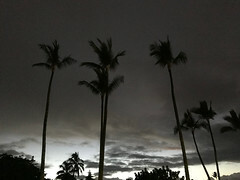 Though it was far offshore, its cyclonic winds drew moisture-laden air from the east right over Hilo, where it fell. Over four days, we received over four feet of rain. Despite the weather, which was still bad on August 25th, the concert raised over a thousand dollars for Puna eruption relief. Brendan and Rebekah both shifted addresses in September. Brendan continued working for Starbucks, but moved out to West Newton. Rebekah began her studies at Union Theological Seminary in New York City. In September we held a special memorial service for the Rev. Susumu Yamane, Pastor Emeritus of Church of the Holy Cross. He had been well loved in the church and the community, and we were glad to honor him for his ministry and service. Shortly after we took on meal preparation for a village of Puna evacuees – for a week in October, then once a week through November and December. I went down a couple times with guitar and ukulele to offer some music along with the meal. By October, however, I was exhausted. I have rarely taken time off in October, but this time I had to. 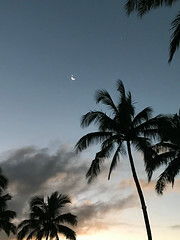 I spent most of it in Kona, enjoying sunsets rather than sunrises. I came back to honor the beloved souls who had passed that year at our annual All Saints worship service, including my dad. Also in October, I began walking each weekday, first thing in the morning. One result was a lot of dramatic sunrise photos. I don’t know that I’m any healthier, but I do enjoy it. The holiday season came with a great project, and great joy. Our Board of Deacons decided to encourage members to bring non-perishable food items, one contributed each day, through Advent. One said that it was a pity that we probably couldn’t find a daily devotional on giving for the season, and I said, “I might be able to write one.” And I did. The result was “An Advent of Giving,” and probably over 400 pounds of food items brought to The Food Basket. We haven’t weighed the last week’s gifts yet. Brendan flew out on December 15th and spent two weeks here. We got to explore some parts of the island, but enough so that he’ll have to return to see more. Rebekah arrived on December 19th, and will stay until mid-January. Well. That’s quite a year. I haven’t even touched on the year in the nation or the world, which had enough strangeness and chaos to fill a bookshelf. Nor have I mentioned several friends’ visits which gave me great joy. Hau’oli makahiki hou – have a joyful, healthy, and happy New Year! If you find yourself wondering why I’m trying to capture what was a very visual worship experience this morning on text, well, I’m ahead of you. What made it work was the real interaction with the participants, some of them children, some of them adults. I’m not going to attempt to quote any of their contributions here, but instead indicate them by my responses. All right. For the story today, I need some help. I need some folks with energetic feet this morning (I realize this is a rough day to ask for that). But come on down now. Right here. Join me. No, don’t sit down. We’re moving about today. That’s why you need your energetic feet. OK. We are now the magi, the wise men who went to bring gifts to the newborn Jesus. So. We’ve read the stars in the sky, and we know that there’s a new king that’s been born in Israel. But… Where do we go? The stars aren’t telling us that much. Where can we go to find a newborn king? The North Pole? Well, yes, I suppose so, but that’s awfully far and I doubt we’ll find a King of Israel there. Well, where do you usually find a newborn King? That’s right, in the palace in the capital. So we’ll go to Jerusalem! Follow me up the aisle. Here we go. Now we cut through this pew here, and then up that way. Some of these valleys get pretty narrow. All right. We made it. Now, can I get somebody to be King Herod? We’ve got to ask him. Great. Thank you. So, King Herod, where do we find the newborn King? Perfect. That shrug was absolutely perfect. Folks, this is exactly the shrug that King Herod used when the magi came to visit, because he didn’t know, either. He had to ask. And the person to ask would be a religious professional. Hm. Are there any religious professionals in the house? Well, yes, we can ask the Chair of the Board of Deacons, but I did have somebody else in mind. Me? Why, yes, I am a religious professional. And so, King Herod, I tell you that the Messiah is to be born in Bethlehem of Judea. Oh, you’d like me to tell the magi that? Now that’s delegation for you! All right, magi, now we’re off to Bethlehem. Which is down this aisle, and between these pews, and gets a little rocky when we get back up to the front of the church. Everybody here? Great! You’ve got one? What did you bring? Spices? Hey, that’s cool. You’re right, they are worth their weight in gold. Say, gold. What a good idea. Did anyone bring any gold? Wonderful! All right, we’ll leave the gifts here. And it’s time to go home. But… wait. Now we need somebody to be an angel in a dream. Great, we’ve got you. What’s your message to us? Not to return to Herod? Because he’s going to do this baby in? Right. Back home by another road. Now we’re switching roles. We’re still in Bethlehem, but we’re no longer the magi. We’re the Holy Family – granted, a rather bigger Holy Family than three, but that’s great, the more the merrier. And we need our messenger angel to come in a dream again. What’s that you say, messenger angel? King Herod is after us, and we should go to Egypt? Oh, you don’t want to go to Egypt? It doesn’t sound safe there, huh? Well, I have to agree with you. But still. We’ve got two options: stay here with King Herod, or go to Egypt. So which is it: Herod or Egypt? So. Up this aisle, and cut across, and down the other way, and across again, and here we are in Egypt. Yes, I know it looks a lot like Bethlehem. All right. So, we’ll spend some time here, and watch the baby grow – wow, look at how big he is! – and we’ve got some news that King Herod has died. We can go back home! Joseph’s got family in Bethlehem, so we could go there. Except that… Herod’s son Archelaus isn’t any better than his father. We’re not going to be safe. OK. Scratch Bethlehem. Where else can we go? Nazareth, you say? Well, why not? With another trip up and down the aisles and between the pews, we’re safely in Nazareth, and Jesus will be safe here. And it should feel rather like home, since it looks so much like Bethlehem, and, for that matter, Egypt. And like Church of the Holy Cross in Hilo. I thank you so much for coming up and helping. I hope it’s given you a sense, if not of how far everybody traveled, at least of some of the difficulties they faced, and the roads they followed. I hope you’ll all travel your roads with God’s help all along the way. One final note: the lay leader observed that reading the Matthew 2 text after this “story” was a tad anticlimactic.